Michael Moore made a name for himself as a big dog in the documentary world with the release of his anti-gun film Bowling for Columbine, in which he explored the circumstances that led to the 1999 Columbine High School massacre. He produced another heavy hitter in 2004 with Fahrenheit 9/11. The movie was based on the presidency of George W. Bush and his War on Terror, and was released during a time of extreme partisanship in the country. Fahrenheit 9/11, to this day, holds the title of the highest-grossing documentary and Moore is back to see if he can recreate that movie magic with Fahrenheit 11/9. The Oscar-winning filmmaker told Bill Maher that the film’s goal is to “get millions of people to polls” to “bring down Trump.” The film opens on Sept. 21, a month and some change ahead of the midterm elections in November. Moore has been outspoken against Donald Trump since presidential election season and this isn’t the first time he’s set out to bring down the sitting president. In August of last year, he embarked on a 12-week Broadway production titled The Terms of My Surrender with the same goal. He also released Moore In Trumpland, a filmed one-man talk explaining his decision to vote for Hillary Clinton (even though he voted for Bernie Sanders in the primaries). 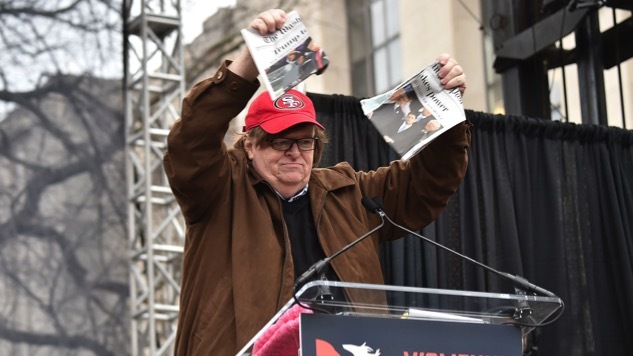 On Thursday, Moore released the first trailer for Fahrenheit 11/9. In the trailer, he refers to Trump as “the last president of the United States,” suggesting that if he’s not impeached before the end of his term, we might not even make it to 2020. We also see appearances from activist and Parkland High School shooting survivor David Hogg and Alexandria Ocasio-Cortez, who is on the fast track to becoming the youngest woman elected to Congress. There’s footage of KKK members burning crosses, Moore spraying “Flint Water” onto Michigan governor Rick Snyder’s lawn and a warning from Roger Stone on the violent uprisings that’ll occur in middle America if Congress begins impeachment proceedings. The current national climate is even more polarized than it was in 2004 when Moore went after Bush and, as is typical, he’s looking to throw gasoline on the flame. In an interview with The Huffington Post, he made an assurance that the majority of Americans agree with him on the issues. “I’m part of the majority. Our choir is much bigger than Trump’s choir or Fox News’ choir.” We’ll see how everything unfolds when the film opens at this year’s Toronto Film Festival. Until then, watch the trailer below.